The third section is variable based on the patients age. For a patient 18 and older, a more thorough periodontal assessment would be completed and for patients under 18, a pediatric assessment would be completed. (In those cases of a patient under 18 with periodontal issues, complete a periodontal assessment instead of a pediatric assessment). Now onto the things covered in this section. Go here for a refresher on normal periodontal assessment. First is all about bone levels. 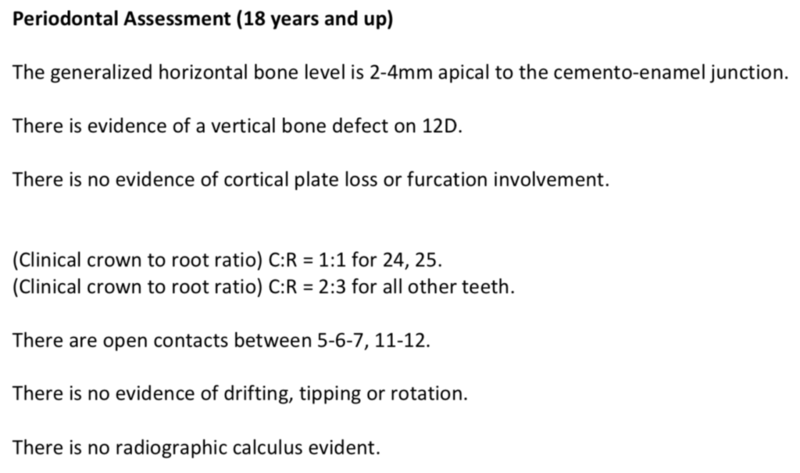 I would start with horizontal bone levels in relation to the cemento-enamel junction. (I used this as a reference point as it is easily identified on images). Also, bitewing radiographs are ideal due to a vertical angle being closer to 0. Then off to any vertical bone defects, furcation involvement or cortical plate loss detectable. Second is crown (clinical crown) to root ratio. An average would be between 1:2 or 2:3 for most teeth. Being that some dentitions could have multiples, I would limit the possible ratios to 3 or 4. I didn’t want students creating a ridiculous amount and would more focus on if the ratio was positive or negative. Third was a combination of multiple different things – open contacts between teeth (true open contacts not a radiographic open contact), drifting, tipping and rotation of teeth. For drifting and tipping the report would include direction such as mesial or distal. For the rotation, I didn’t add in the direction but go for it if you’d like. This area would also include any restoration defects such as overhangs or open margins identified. Last is radiographic calculus interpretation. Now, onto a sample completed report. Don’t forget a negative statement for everything listed above if nothing is identified to show that those things were still evaluated for but not found. Next will be pediatric assessment for patients under 18.